You are here: Home » The Wisdom » The Great Speech » 13-The Congress was opened on Thursday, the 4 th September » 47-"You will proclaim a republic a republic!" To tell you the truth, it was by no means improbable that the Commander-in-Chief of the Western Armies of the Ottoman Empire, who had caused countless hosts of Turkish heroes in Macedonia to be decimated and annihilated and who had given priceless Mace donian territory as a free gift to our enemies, possessed all the necess ary qualifications to make himself the slave of the designs of Wahid- eddin in the most critical hours of the Empire, and that the first thing this notorious Commander-in-Chief of the Army would think of doing when he came into power would be to put his most skilful collaborator, his Chief of the General Staff, in charge of the War Ministry. But why should he not be congratulated on his sagacity in having guessed so quickly and so easily that the real aim of the national movement was the creation of a republic? This story was related to me by a very honourable colleague who is present here now and who heard it from the lips of Izzet Pasha himself. Djemal Pasha told us in a telegram in cipher on the 9 th October, that they had decided to send Salih Pasha, Minister of Marine, to restore direct communication with the Representative Committee. 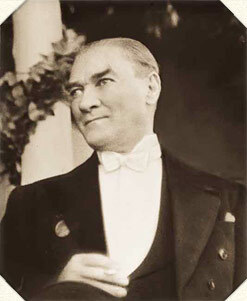 Djemal Pasha, after having explained that it seemed advisable, owing to the bad state of Salih Pasha s health, that the rendez-vous should be as near as possible and that he would travel by sea, asked me what members of the Representative Committee would be there and where the meeting would take place. We replied on the 10 th October that the place would be Amasia, and we told him at the same time that Rauf Bey and Bekir Sami Bey had been chosen by the Representative Committee to go there to meet him. We requested him to let us know in good time when Salih Pasha would leave Constantinople and when he might be expected to arrive at Amasia. We continued to do everything we could to extend the national organisations and consolidate them. We worked simultaneously to arrange for the elections and hasten them on. We informed all the people concerned what our views were on this question, and suggested candidates wherever it seemed to be necessary. Although adhering to our principle that the union should not put any candidates in the field, we ardently hoped that those candidates who had accepted the programme and decisions of the Committee for the “Defence of the Rights of Anatolia and Rumelia” should stand, and we let it be under stood that they came forward voluntarily as representing the policy of the union. From some districts we received protests in which cases vfere quoted where certain officials who were loyal to the national movement had been transferred, while other officials still remained at their posts, notwithstanding that they had been expelled by the people on account of their hostility to the national movement. In each of these protests we were asked in what way and to what extent our understanding with the new Cabinet was to be accepted. On the II th October, we wrote to Djemal Pasha with the object of drawing the attention of the Government to these facts. *) Literally, “Military Society of Protectors/ embezzlement, Major Kemal Bey, member of the former Halaskar party, Hakki Effendi, a Major in the Artillery and formerly head of the railway service at Panderma, Newres Bey, a degraded major on the General Staff, about whom it was uncertain whether or not he still belonged to this union, all of these persons had been expelled or dismissed from the Army on account of serious offences as well as a few others who were notorious for their vices and immorality. In No. 8,123 of tne “Ikdam,” of the 23 rd September, 1919, this society had published an article hi which they had constituted them selves “Protectors of the Country and Nation.” While Djevad Pasha was a member of the War Ministry, this society was persecuted, but this ceased as soon as there was a change in the Ministry. The officers became anxious about the existence and activities of this society, and complaints began to reach the Representative Committee. On the 12 th October, I asked Djemal Pasha, the Minister of War, in his own interest to suppress this centre of rebellion, to punish all of its members severely and to publish a circular note informing the Army of the fact. On the 14 th October, Djemal Pasha sent me a clear and detailed telegram, in which he said: “This has been officially decided upon/ (Document 151) and I made this known to the whole of the Army on the 15 th of the same month. But I have no recollection of this formal decision of Djemal Pasha s ever having been in any way carried out.